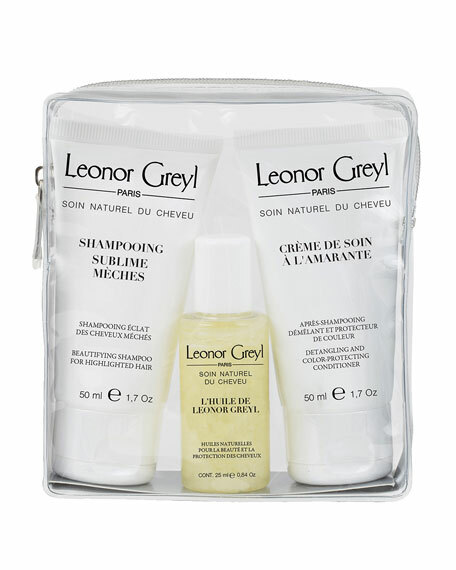 Smaller, TSA friendly versions of our most sought after hair care staples, a shampoo, masque and treatment, in one kit, tucked in a clear beauty case. Whether traveling to the gym, a beach resort or Bali, these customized kits are perfect to pack or give as a gift. This iconic beauty product is a pre-treatment to be used prior to treatments or shampoos. Detangles, nourishes and softens hair. Protects against environmental damage like sun, seawater and chlorine. Perfect at the beach or pool. This gluten-free, award-winning shampoo is formulated with key extracts and protein and is created specifically for color-treated and/or highlighted hair. Shampooing Sublime Meches protects and prolongs the life of color, highlights and radiance, reviving shine and nourishing hair. The newest treatment product in the Leonor Greyl portfolio, Crème De Soin a L'Amarante, is an indulgent color protecting and detangling conditioner, created to prolong the life of your color and enhance its vibrancy, without weighing down hair. In addition to protecting color, it will detangle hair and protect it from everyday environmental stressors, like the sun, that can age hair.